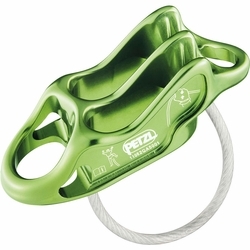 Petzl REVERSO 4 Belay / Rappel Device. Ultra-light multipurpose belay/rappel device with braking adapted to different rope diameters and suppleness; Reverso mode This belay/rappel device is lightweight and easy to use. V-shaped friction channels, with asymmetrical side grooves, adapt the rope friction for better control (braking adapted to half, twin and single dynamic ropes). Reverso mode for belaying one or two seconds.